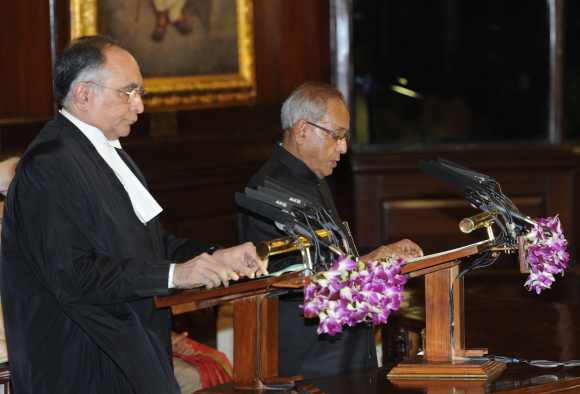 India's former Finance Minister Pranab Mukherjee was sworn in as the country's new president on Wednesday, July 25th, 2012. Mukherjee succeeded Pratibha Patil to become the country's 13th president. Pranab Mukherjee had earlier held key portfolios like the foreign and defense ministers in his political career. The 77-year-old veteran politician was administered the oath of office by the Chief Justice of India at the parliament. Pranab Mukherjee was from the eastern state of West Bengal. Pranab Mukherjee won the president election with the support of the the ruling Congress party-led United Progressive Alliance (UPA). Pranab Mukherjee holds two masters degrees as well as a law degree from Calcutta University. Pranab Mukherjee had Published below books. 5. Challenges Before the Nation (on Indian National Congress)- 1992. Read inspiring Quotes of Pranab Mkherjee.